"He is everywhere--above us, and about us, and he dreams betimes in the high places among the stars." Howard provides an excellent foundation for the “round-robin.” The tale begins in the eternal snows of Vanaheim, where the crook-legged fifth-born infant son of Gudrun is, literally, thrown to the wolves. James Allison reveals that the child would later become known as Ghor the Strong among the Æsir. REH also implies that Allison is relating this particular tale from his death-bed. This chapter showcases some of Wagner’s better writing. It is filled with the “blood and hate” that de Camp derided in regards to KEW’s fiction, but which is so appropriate for this tale. Ghor grows to manhood as a member of a wolf-pack. Wagner intimates that there is some sort of “were-wolf” lineage in the blood of Genseric’s son. The red-headed Ghor joins a band of Æsir (parallels to Wagner’s “Reflections for the Winter of My Soul” are ironic, indeed). He then, unknowingly, kills his father in battle. Subsequently, he learns the story of his outcasting and the names of his mother and four brothers. Long story short: Ghor tracks down all five of his surviving relatives and kills them. I am a fan of JPB’s fiction, but I am compelled to agree with Rusty Burke that Brennan totally short-circuited the plot that KEW set up in the preceding chapter. The hunt that might have constituted an entire novelet is compressed and short-changed by Brennan. Also, JPB depicts Nordheim as a faux Scandinavia, complete with fir trees (a conceit carried forward into later chapters). This vision of Vanaheim and Asgard is contradicted by every single description given us by Robert E. Howard. Things really start to go off the rails in this chapter. Tierney has Ghor visited by “Ythillin,” an Atali-esque messenger of the “Ice Gods.” Forgetting the fact that the only god (to judge from “The Frost-Giant’s Daughter” and nearly all of the “Allison” yarns) that the Nordheimr render reverence to is Ymir, the worst thing about this chapter is that “Ythillin” (what sort of Nordheimr name is that, by the way?) delivers a prophecy unto our wolfish hero. No more free wandering and carnage for lupine Ghor. Oh no. Tierney railroads him into saving Nemedia. Apparently, the “Ice Gods” of Nordheim give a good “Ice God”-damn as to what happens to a particular Hyborian nation (Ythillin specifically mentions saving Nemedia’s civilization). Seemingly, Ghor’s adopted tribe of Æsir is supposed to correspond to the one which bolsters Nemedia in its final days, as mentioned in the “Hyborian Age” essay. However, the reason as given by Howard (and the same reason given in all other “Allison” stories) is wander-lust, not some divinely commanded emigration. The less said about this chapter, the better. I’ll note that MM totally throws any of Howard’s well-established naming conventions right out the skalli-door. Oh yeah, and he introduces “Snow Camels” (Moorcock’s capitalization) to the list of Hyborian Age fauna. Moorcock trots out the hackneyed plot-device of saving a princess. 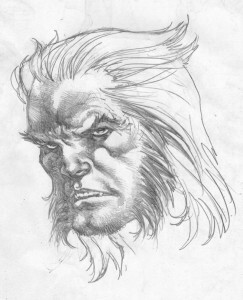 As far as I know, this was Moorcock’s first and only attempt at writing a “barbarian” character. If anyone needs further evidence that Moorcock could not/cannot write Howardian pastiche, here is the proof. This chapter is very well-written, as one would expect from a master of Sword-and-Sorcery such as Mr. Saunders, but it is crippled by the ill-thought and ill-wrought ideas of the contributors in preceding chapters. Decently written. Ghor’s love (“Shanara,” introduced by Moorcock) is taken away to Turan. Who’d’ve thunk it? Beforehand, I’d like to state that I’m an MWW fan. That said, while this chapter isn’t bad, it could have been better. Wellman inexplicably makes the Turanians Set-worshippers. However, there is some good repartee and action, here and there. Read Wellman’s Cahena for something much better. Schweitzer authored the much- (and justly) maligned, Conan’s World and Robert E. Howard. However, I have the courage to state that I find Schweitzer’s The Mask of the Sorcerer to be a worthy novel. That said, this chapter is execrable. Can someone please explain to me why Jonathan Bacon felt it necessary for this author to contribute? Was Van Vogt even a fan, of any kind, of Robert E. Howard? In this chapter is introduced the plot element of the “magical sword of Genseric.” As if Tierney’s prophecy wasn’t enough. I will say that I’d rather see Lumley write Howardian pastiches over Moorcock or Van Vogt. Surprisingly, in the Hyrkanian cluster that this round-robin had become, FBL turns in an almost respectable chapter. Considering that this is the same literary titan who once called REH’s fiction (at least the Conan yarns) “boys’ stories,” I am curious as to whether Long had a change of heart at a late date, or if he was just whoring himself out for some reason. While I’m a fan of Cole’s, this chapter is only readable. The accumulation of ill-conceived plot-devices left him little room to maneuver, perhaps. Campbell attempts to salvage his chapter by focusing upon Ghor’s struggles against Stygians and Hyrkanians, with a dose of the Mythos thrown therein. A good chapter. There are those who seem to find goodness in Munn’s prose. I’ve yet to do so. He certainly tried to cram as many extraneous Mythos references into his chapter as possible. I will give him that. Was MZB a Howard fan (see Chapter X)? That said, this chapter is not badly written, to my surprise. This final chapter is utterly ridiculous. It also shows definite signs of Lupoff never reading any other tales in the “Allison” series. Could Ghor, Kin-Slayer have turned out better? I certainly think so. If Bacon had appointed Wagner as “team captain,” the entire enterprise might have gone in an excellent direction. Strictly adhering to the round-robin principle does not seem to have served Ghor, Kin-Slayer very well. While not naming names, I will say that I feel it would’ve been better if fewer authors had written more chapters. Also, where were Poul Anderson, [redacted] and David Drake in all of this? 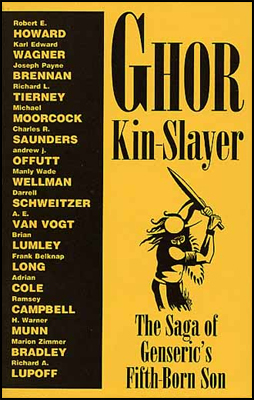 Ghor, Kin-Slayer is almost a perfect microcosm of the entire history of Robert E. Howard pastiches. The adage of “garbage in, garbage out” would certainly apply to this “round-robin.” One bad idea, demonstrably contrary to Howard’s practices or intent, leads to another. In a relative eyeblink, the story (or saga) becomes something that the Man From Cross Plains would have never recognized as springing from his gifted brow.